Twin Pillow Top Pocketed Coil Mattress and 5" Grey Quilted Low Profile Wood Foundation by Southerland Bedding Co.
Gel-infused memory foam adjusts to the contours of your body while offering superior comfort. Gel also adds a combination of cooling & support factors for a durable and cool sleeping experience. Our Foam Encasement System locks in the innerspring unit and forms a durable seating edge that increases your sleep surface by 10-20%. 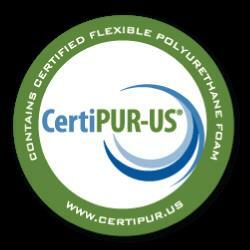 The foam in the bedding has been tested to meet CertiPUR-US rigorous standards for emissions, content, performance, and durability. This mattress is Certified to be made with pure foams. Comfort and support foams lock in the comfort and feel like new for longer from being crushed to minimize the initial softening. The Arietta PT Twin Pillow Top Pocketed Coil Mattress and 5" Grey Quilted Low Profile Wood Foundation by Southerland Bedding Co. at Wilcox Furniture in the Corpus Christi, Kingsville, Calallen, Texas area. Product availability may vary. Contact us for the most current availability on this product. Z3SDBXX1W5-T Twin Low Profile Base 5" Height 1 5"
Z5CFAA1PP1-T Twin Pocketed Coil Mattress 1 14.25"
Get the great night's sleep you deserve with the Arietta Pillow Top mattress from Signature by Southerland. The support core is made up of two HD Loft Pads and Foam Encased Individually Wrapped Coils that adhere to the contours of your body for maximum support and reduced motion transfer. A layer of Comfort Foam not only provides extra comfort, but also helps lock in the comfort to keep the mattress feeling new while the Gel Infused Memory Foam provides comfort to the lumbar regions. On top of the mattress sits a Luxurious Tencil™ Quilted Cover that is cooler than linen, softer than silk, and more absorbent than cotton. The Arietta PT collection is a great option if you are looking for Mattresses in the Corpus Christi, Kingsville, Calallen, Texas area. Browse other items in the Arietta PT collection from Wilcox Furniture in the Corpus Christi, Kingsville, Calallen, Texas area.